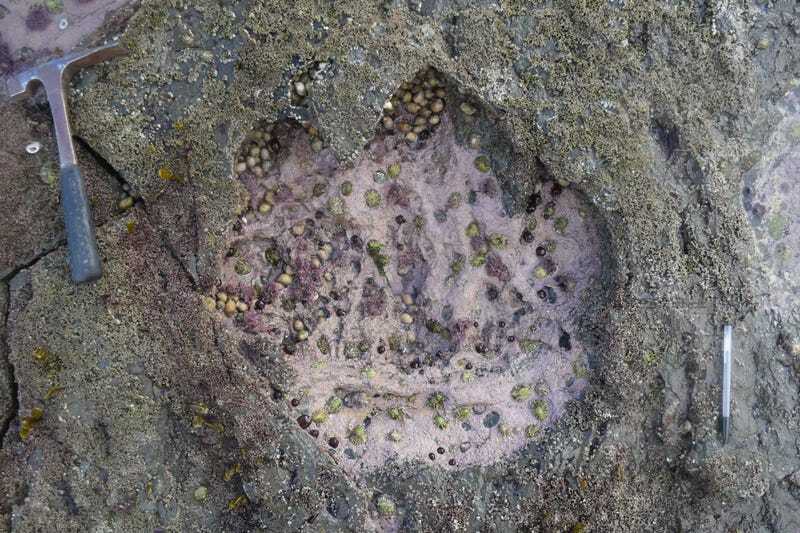 One of about 50 footprints found on the Isle of Skye, this impression belonged to a four-legged sauropod. Researchers have uncovered more than 50 dinosaur tracks along a Scottish beach, some of which have retained their original shape and even the outline of claws. The discovery is shedding light on the kinds of dinosaurs that lived in this region some 170 million years ago. Fossils from the Middle Jurassic period, dating to between 174 million to 164 million years ago, are frustratingly rare. Part of the problem is that so few of the sedimentary layers that date back to this period are exposed, making discoveries difficult. 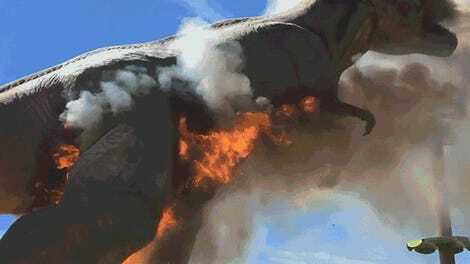 This is a shame, because the Middle Jurassic was a critical time in dinosaur evolution, an era that witnessed the emergence of the earliest meat-eating tyrannosaurs, the spread and diversification of plate-backed stegosaurs, the introduction of the first birds, and the rise of the long-necked, four-legged sauropods. Brothers’ Point as it looks today on the Isle of Skye. That’s why the discovery of 50 new dinosaur footprints on Scotland’s Isle of Skye is being celebrated as an extraordinary discovery. The preserved impressions, uncovered at Brothers’ Point along the north-east coast of the Scottish island, were analyzed by researchers from the University of Edinburgh, Staffin Museum, and Chinese Academy of Science. Today, this area is popular among hikers looking to snap photographs of grassy, narrow ridgelines, waves crashing onto rocky beaches, and herds of sheep munching on seaweed. During the Middle Jurassic, however, this region was vastly different. Back then, Skye was a subtropical island situated much closer to the equator, containing lagoons, rushing rivers, and vast beaches. Oh, and also gigantic sauropods and carnivorous two-legged theropods, as this latest discovery affirms. Artist’s impression of four-legged sauropods and a bipedal theropod wading in a Jurassic-era Scottish lagoon. Three years ago, the same team of researchers uncovered dino prints at a different location on the island, but in addition to sauropod tracks, the new prints also include so-called tridactyl tracks, or three-clawed footprints. It turns out that the long-necked sauropods weren’t alone; they shared the region with some carnivorous theropods, distant cousins of the T-rex, which wouldn’t make its dreaded appearance until much later. Details of this discovery were published this week in the Scottish Journal of Geology. The meat-eating theropod who left this track measured about six feet in height. These new tracks were difficult to study owing to tidal conditions, erosion, and changes to the landscape, but the researchers were assisted by aerial drones and special cameras which allowed for mapping and the construction of virtual models. In all, the researchers documented around 50 tracks, including two trackways and many isolated footprints. In some cases, the prints—some the size of car tires—still retained their original outline, the shape and position of the dino’s toes, and even the presence of claws. These tracks were originally laid down by the dinosaurs in muddy, shallow water, but then sediments, acting like wet concrete, washed over the footprints, solidifying and allowing for their long-term preservation. It’s impossible to know the exact species of dinosaur from footprints alone, but the sauropods who made them likely measured up to 15 meters in length and weighed more than 10,000 pounds. These were some of the largest terrestrial animals of the Middle Jurassic era. The tracks laid by the theropods were made by several medium-to-large specimens, about five to six meters long and weighing a ton. And yes, Brontosaurus were real.